Following on from Suzanne’s guest post which showed a wonderful whole-class collaboration to create a Rainbow Fish craft, here’s a fish tank craft on a smaller scale. L celebrated her fifth birthday this weekend with an ‘under the sea’ party and all the guests made their own aquarium complete with a beautiful rainbow fish to swim around in it. 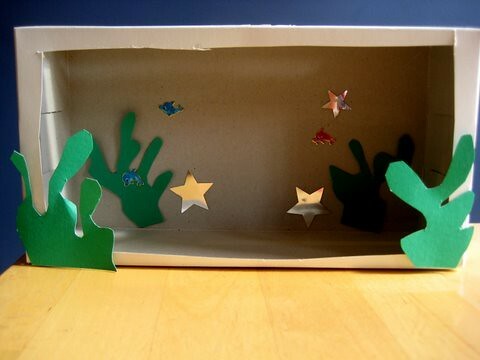 This junk model fish tank is easy to make, with just a few simple instructions and also gives each child the scope to be creative and create exactly the kind of fish they like best. Start with an old tissue box. 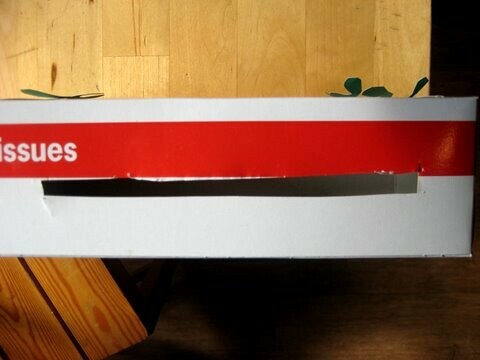 Cut a long, narrow letter box style slot in the top. Next enlarge the hole the tissues come out of to create a large window for your fish tank. (I prepped all this cutting out in advance for the five-year-olds.) Then the creating commences! Invite the children to add some under-the-sea features to the back wall and around the frame. We used seaweed cut from card, fish stickers and foil starfish shapes. Time to design your rainbow fish. 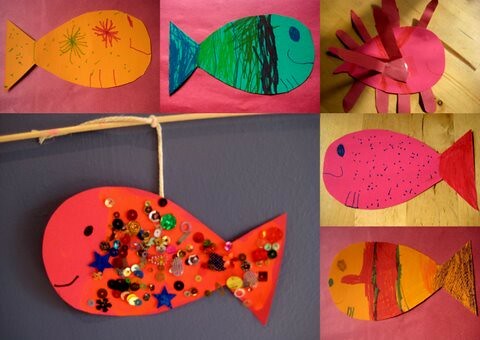 We used card for the fish shape and offered the children pens, pencils, glitter, sequins and glue and let them create. 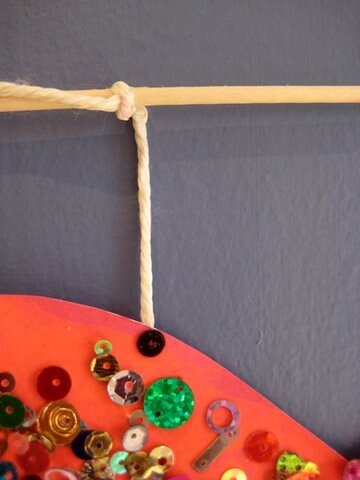 Fasten a piece of string or yarn to the back of your fish with sticky tape and tie the other end to a stick. We used wooden kitchen skewers (with the pointy end snapped off) but a twig or drinking straw could work fine too. Poke the stick up through the letter-box slot, let the stick twist a little to sit on the top of the tissue box and your fish is floating in his new home. You can move the stick backwards and forwards to make him swim. 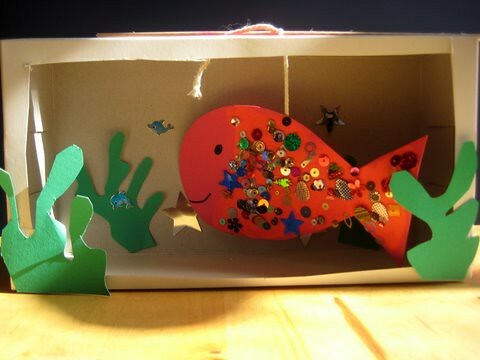 A lovely fish tank craft to make your rainbow fish feel right at home. This is just adorable and it looks so simple to make. Very cute fish and tank! We are planning to make a fish tank as well as Annabel`s topic at shool is “under the sea”. Hi mermaid – we only had six guests so it wasn’t too bad. We do have a lot of spare tissues hanging about though with no home to live in anymore!! This is such a simple and pretty fish tank,love it. Oooh I love a fish tank that a) you don’t have to clean and b) has lots of sparkly bits! Beautiful! Love this project, so adorable! thanks so much for sharing on Craft Schooling Sunday! It’s definately on our list to make now! awesome!! i loove this idea! !